New template! Check out the Lord Nelson here. Biggie Smalls – The Notorious C.A.T. Can dogs really run marathons? With some caveats, yes. It’s important to have the right kind of breed, the proper vet check-ups, and some serious training first. Running a marathon with your dog can be possible. Here’s how to successfully run a marathon with your four-legged friend. Which Dog Breeds are Best to Run Long Distance? Before we begin, it’s important to recognize that some dogs are better suited to marathon running. Others may prefer shorter runs or may only like to go on quick walks to the shops and back. It’s important to know the basic build of your dog’s breed to have a good idea of what your dog can handle. Certain dogs like pugs or other flat-faced breeds are not ideally suited to running for longer periods of time. They are very likely to end up overheating during a run and may struggle to breathe properly. Other dogs such as Pitbulls and Golden Retrievers would prefer for you to take them on shorter, much faster runs. Dogs that were primarily bred for work, on the other hand, are far more inclined to run marathons. Some good examples are German shepherds, German shorthaired pointers, Weimaraners and Dalmatians. Regardless of the breed, you should take your dog to the vet to ensure that they are able to handle a marathon with you. When going out running with your dog, make sure he knows basic commands so he can cope in any environment. He should not pull on his leash because that can seriously injure you both. When planning the ideal pace for you and your dog, try to gauge his natural pace during a trot. That should be the speed you run together during a marathon, with no sprints or very fast running speeds. Otherwise make sure to pack treats, food for your dog and clean drinkable water. Always be vigilant of your dog’s condition during runs. This might mean taking more frequent breaks than you normally would. If you take the proper precautions and care, both you and your dog will thoroughly enjoy the experiences you have out on the open road. Bio: Sarah Jones writes for Crazy Pet Guy. She adores pets and loves spending time with them. For that reason, she started her blog to share what she knows and what others have taught her. Check out this cat painting of @puffin_gram as the brave, victorious general from the American Revolutionary War. This work is based on a portion of Emanuel Gottlieb Leutze’s classic oil painting, Washington Crossing the Delaware. The heroic cat starring in this custom pet portrait fears neither the bark nor bite of the Hessians, but he would prefer to stay dry and avoid the frigid currents of the Delaware River. The fate of the galaxy rests in the paws of these splendid pets! 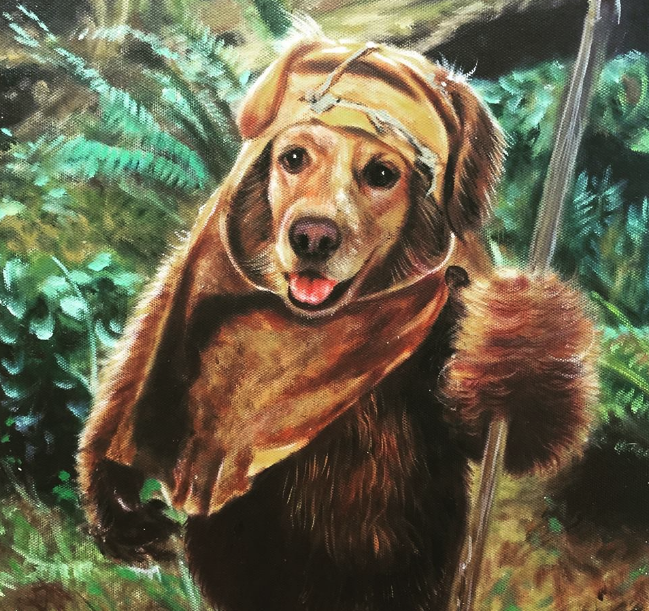 Here are some of our custom Star Wars-themed pet paintings — they are some of our favorites, and we know you’ll love them too. The dashing Han Solo makes an appearance in this dog painting. Canine Jedi Master Yoda wields his lightsaber. And another, darker take on yoda. The only thing cuter than an ewok is a dog in an ewok costume. Chewbacca’s best friend Han Solo is just as furry as him when both are in a dog painting together. The Jedi in this dog painting is preparing to fend off the Separatist armies. And dogs, too. Why not? Ready to commission your own custom pet art?